Maggot debridement therapy is a safe and very effective method for treating poorly healing wounds. Here is an example of an ulcer on the ankle of a 59 year old man. He came into my practice after consulting many other doctors who had prescribed antibiotics or who diagnosed it as a venous stasis ulcer. The patient first developed a wound on the medial malleolus of his right ankle when he was a young child riding in the basket of a bicycle. The medial malleolus is the protruding part on the inside of the ankle which is part of the tibial bone. The spokes of the bicycle wheel broke as his foot was trapped so the injury was severe. Eventually, this wound healed with a silver colored scar and did not bother him for about 30 years. However, when he was in his early forties he hit his ankle with a piece of wood and developed another wound. It was not at the same location as his childhood injury but it was more proximal (3-4 inches towards the knee). Various antibiotic treatments were unsuccessful. After one antibiotic treatment he developed persistent diarrhea for one year so he was reluctant to take antibiotics again. He had been struggling with this painful wound for almost 20 years when an acupuncturist recommended maggot debridement therapy. His next challenge was to find a physician willing to offer this. Fortunately, he was able to find me through the Monarch Labs website. This is what his wound looked like during the first visit before receiving maggot debridement therapy. 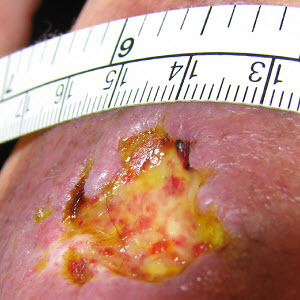 Nonviable, necrotic (dead) tissue is visible in the wound. In the following picture you can see the maggots. They are only a few millimeters in length. As they feast on the dead tissue they are able increase in size rapidly. It is not unusual for them to become four to five times bigger in one day. Two days later the wound looked much cleaner. The maggots had removed the necrotic tissue. This makes it possible for the wound to heal and close. Interestingly, the maggots were no longer in the wound when we removed the dressing. The patient was sure that they had not escaped so the likely explanation is that the maggots ran out of dead tissue to feast on and died. The wound looks much better. The maggots have removed the necrotic tissue. This is the second application of maggots. This a short video of the maggots moving around in the wound. 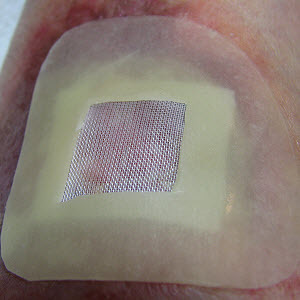 This is what the wound dressing looks like. It is secured with tape on all sides to make sure that maggots don’t escape from their “cage”. The center of the dressing allows the maggots to breathe. The maggots and the wound are now covered by a hydrocolloid wound dressing. The following pictures are from Day 3, four days after the first application of maggots. The wound looks clean. The maggots have greatly increased in size. Grown maggots are visible after removal of the dressing. After the fourth application the wound is shallower. The diameter of the wound has not yet changed significantly. The area around the wound is less tender. After the fourth application the wound is shallower.